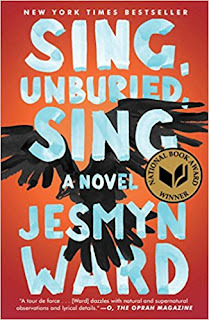 Summary (from the inside flap of the book): In Jesmyn Ward's first novel since her National Book Award-winning Salvage the Bones, this singular American writer brings the archetypal road novel into rural twenty-first-century America. 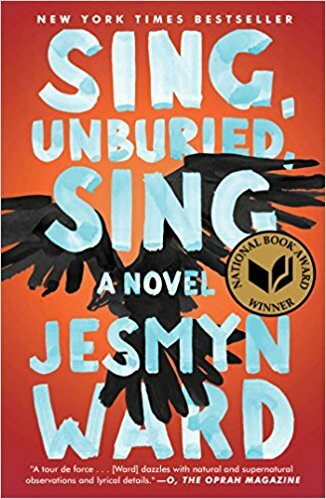 An intimate portrait of a family and an epic tale of hope and struggle, Sing, Unburied, Sing, journeys through Mississippi's past and present, examining the ugly truths at the heart of the American story and the power--and limitations--of family bonds. Jojo is thirteen years old and trying to understand what it means to be a man. He doesn't lack in fathers to study, chief among them his Black grandfather, Pop. But there are other men who complicate his understanding: his absent White father, Michael, who is being released from prison; his grandfather Big Joseph, who won't acknowledge his existence; and the memories of his uncle, Given, who died as a teenager. His mother, Leonie, is an inconsistent presence in his life and his toddler sister's lives. She is an imperfect mother in constant conflict with herself and those around her. She is Black and her children's father is White. She wants to be a better mother but can't put her children about her own needs, especially her drug use. Simultaneously tormented and comforted by visions of her dead brother, which only come to her when she's high, Leonie is embattled in ways that reflect the brutal reality of her circumstances. When the children's father is released from prison, Leonie packs her kids and a friend into her car and drives north to the heart of Mississippi and Parchman Farm, the state penitentiary. At Parchman, there is another thirteen-year-old boy, the ghost of a dead inmate who carries all the ugly history of the South with him in his wandering. He, too, has something to teach Jojo about fathers and sons, about legacies, about violence, about love. 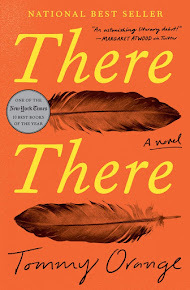 Review: This is the first Book of the Month book that I've read so that was fun. I had only read a couple reviews of this book before I read it and they both glowed, loving this book. For me, it isn't love, but I totally appreciate this book, which is different, but still positive. Ward's writing is wonderful; she has a way with words that make you feel that you are in the moment with the characters, feeling their pain, hearing their sounds, and smelling their surroundings. She captures life of this poor rural Mississippi family in a way that makes me think of Hilary Jordan's Mudbound. And the characters. We hear the story from the point of view of both Jojo (the 13 year-old boy) and his mother Leonie. I immediately wanted to take care of Jojo who has burdens palced upon him that no one, let alone a child, should have to deal with. He is care taker to his toddler sister, helper to his grandparents, Pop and Mam, so he is constantly wary, hungry, tired, and on edge. I could feel his sense of unease. And I wanted to smack Loeonie. Her dependence on drugs, commitment to her husband, Michael, and her lack of responsibility were so frustrating. But so real. The only part of the novel that didn't work for me is the magical realism; I'm not good with that. This only really becomes a problem in the second half of the story when Ritchie, the ghost of a 13-year-old prisoner, appears that I started to lose my love of the book. So, if you're okay with that sort of thing, you'll love this. If you aren't just be prepared and read the book anyway since the rest of it is so rich.